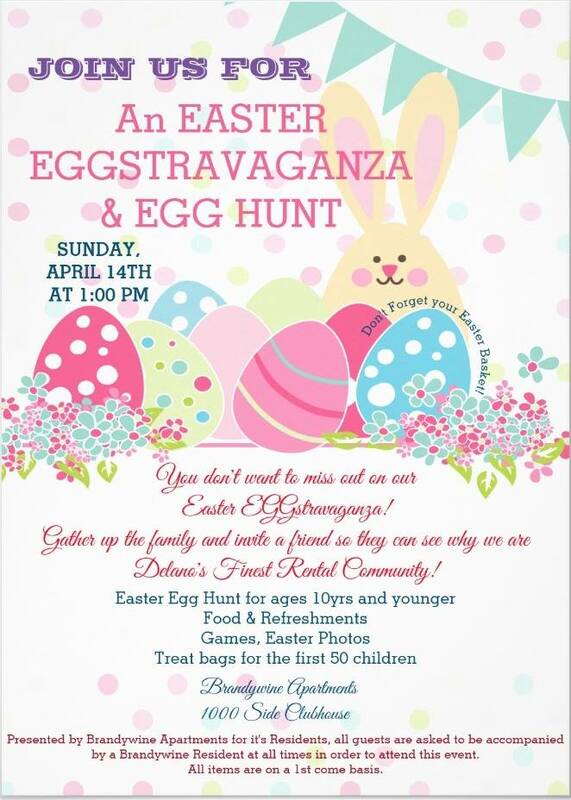 Come join the fun as Brandywine hosts it’s annual “Easter Eggstravaganza”. This is the largest event we host throughout the year! Join us Sunday, April 14th at 1:00pm. Kids are invited to bring a basket to the 1000 Side Clubhouse and gather all the hidden eggs and Easter surprises they can find. Plenty of goodies will be provided for everyone! Children must be accompanied by an adult. We will have an Easter Egg Hunt ages 10yrs and younger, Food, refreshments, games and treat bags for the 1st 50 children. So gather up the family and invite a fried so they can see why we are Delano’s Finest Rental Community! Note: Event is strictly for Brandywine residents, all guest need to be accompanied by a Brandywine Resident in order to attend this event. All items are on a 1st come basis. We look forward to seeing you there!! Previous Elected Officials & Community Mixer!